Below, my slides from today’s Shifting Role of Organization Development in Business Conference in St. Louis. To view presentation within this site, scroll below the 2 slides. You can download Adobe Acrobat or PowerPoint version just below. 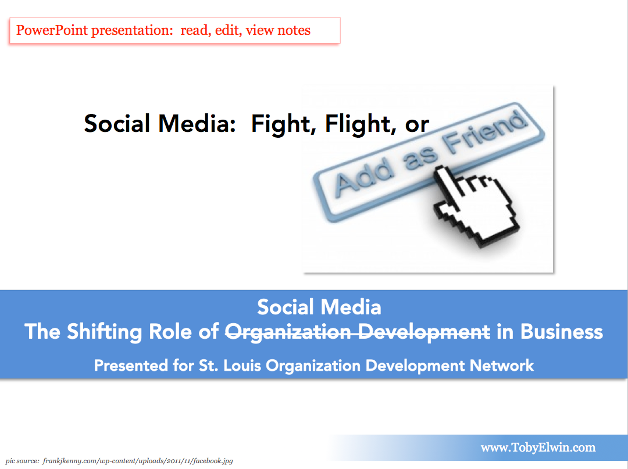 Many thanks, once again, for the St. Louis Organization Development Network invitation and their efforts bringing the community together. Download my PowerPoint version to review my page notes for more detailed notes and sources. View on SlideShare and more to come from day’s fantastic conversations. Thank you, Toby. This was a very engaging presentation. I particularly liked your view on building personas to attract the right audience to your web content. Can you share your view on the companies that have done well at honing their content to the right personas? Here are the visual resume and timeline PowerPoint slides you requested to edit and create a visual resume and timeline like the one I use. I appreciate your kind words on my Fight, Flight, or Friend presentation and our conversation after. Now about your question on who has done personas well. I am not sure I could deliver a better list than David Meerman Scott‘s running effort to share the best he’s seen as well as offer many free presentations and eBooks. He was where I learned the concept. + Eyeball Wars are each excellent. HubSpot is another excellent source. Toby, I am the young woman who came up to you immediately after you finished your presentation Wednesday. I am very excited to stay in touch with you and your work. 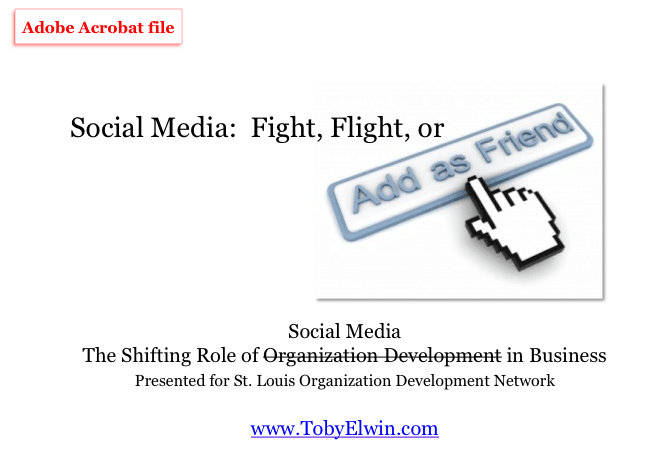 I am hoping to incorporate the social media/social network analysis/marketing influence into my future OD work. I am brand new to the field, and I am pleased that I have found a particular aspect or niche of OD so early on. Again, thank you! Mary – it was great to have you introduce yourself. Coming from marketing provides a distinct benefit to organization development (OD) initiatives. There are academics that certainly know more about OD. But sociology, anthropology, behaviorism, psychology are not exclusive to OD. The overlap and leverage of both are clear. The added marketing element is the focus on the message: the branding, advertising, and promotion elements. Today there is an added element for us to learn and pollinate OD from the marketing side. Social media allows you and anyone to join and create a community of practice. And social media welcomes, feeds, and explores with you. Leverage the transparency of communities you look for and that all opt in to. A simple example of transparency is an invitation to take a look at some Twitter lists. Twitter is a great tool to manage, review, and engage in thought leadership and conversations. Manage, because you have 140 characters, no filler there. Here are two lists I created with my Twitter account @TobyElwin. Another good thing about Twitter lists is you can subscribe to someones or make your own (and people can subscribe to yours). Twitter.com/TobyElwin/Lists/OD and Twitter.com/TobyElwin/Gadget [my Twitter Gadget list one is pretty poorly labelled, I agree, but has a lot of social media writers, bloggers, and marketers]. Perhaps you can recommend a list you create custom to your need. I look forward to our continued learning.